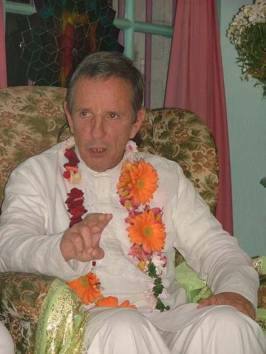 Last week we were extremely blessed by the inspiring presence of Sripad Srutasrava Prabhu, from California. 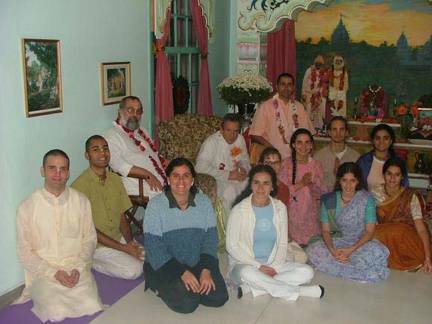 He was invited here by Sripad B.V. Trivikram Maharaj, and together they are touring throughout Brazil in order to distribute the nectar of the Krishna Conception to all. They have stayed here for three days, and there were three programmes, one for each day. All of Sripad Srutasrava Prabhu’s presentations were so sweet and broad and deep. 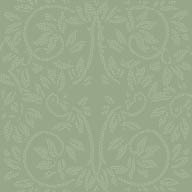 The hearts of all were captured by his enthusiastic mood and elevated speech. 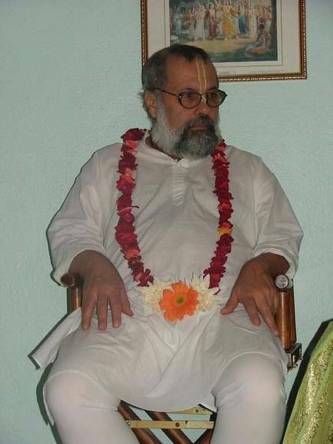 The translation and comments by Sripad B.V. Trivikram Maharaj were always lively and happy and all were impressed by his saffron clothed figure. The first meeting was held at the Sri Chaitanya Sridhar Asan. It was a devotional gathering where the devotees received instructions on how to progress in spiritual life. 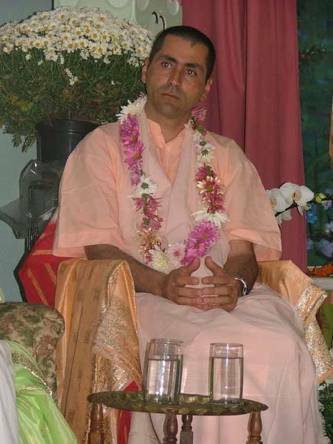 Sri Chaitanya Sridhar Asan of São Paulo. Sripad Bhakti Vijay Trivikram Maharaj, the leader of this series of preaching programmes. Sripad Bhuvana Mohan Prabhu, our host. Sripad Srutasrava Prabhu, our guest of honour. He spoke in such a moving and enthusiastic mood… We were all touched and nourished. 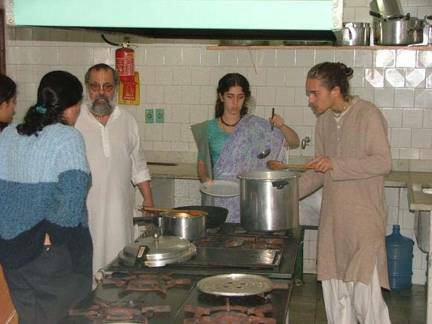 After the programme, the kitchen was busy – preparing bhoga for offering. The second meeting was a really successful preaching programme at one of the most important Medical Schools of Brazil. Sripad Srutasrava Prabhu was invited to talk about “The Search for Inner Fulfilment.” It was a super beautiful presentation for over forty souls (of which we unfortunately lack pictures). 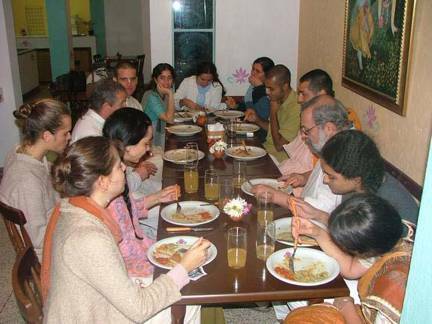 The third and last meeting was held at the most important yoga school in São Paulo, it is a place where all the higher class women and men go to look for some balance in their lives. 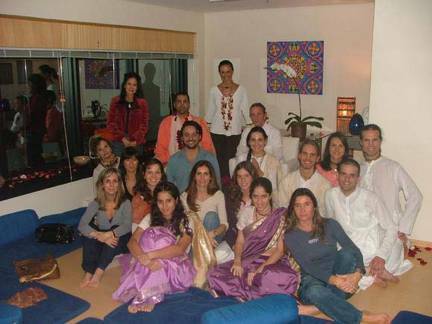 We arranged a Bhakti Yoga Class, attended by important personalities of the São Paulo scene. The owner and director, Marcia de Luca, was absolutely charmed by the presentation and she invited Sripad Srutasrava Prabhu to an interview on her radio show, when he will be able to speak to over 20,000 people. Bhakti Yoga Class at the “Integrated Center for Yoga, Meditation and Ayurveda.” Presenting the highest type of yoga: Bhakti. All were heart-melted! This woman in a white shirt is a very famous actress. 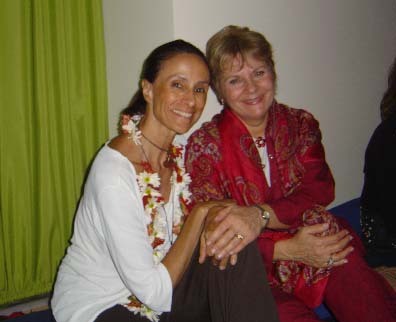 She has already visited our Ashram in Campos do Jordão. 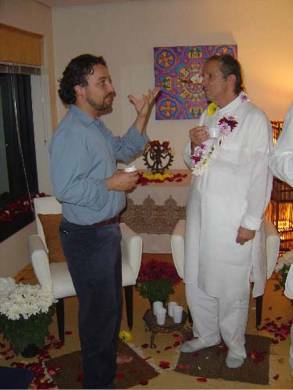 Sripad Trivikram Maharaj and Sripad Srutasrava Prabhu formed a beautiful team. and Madhava Priya DD. Happy and enchanted! This young man was so impressed. He didn’t know how to thank enough. He immediately offered to clean up everything after the programme. We then left Sripad Srutasrava Prabhu and Sripad B.V. Trivikram Maharaj at the airport to fly on to Brasilia. A few hours later we were with Rohini Shakti DD at an important meeting at one of the biggest insurance companies in the world — Mapfre. 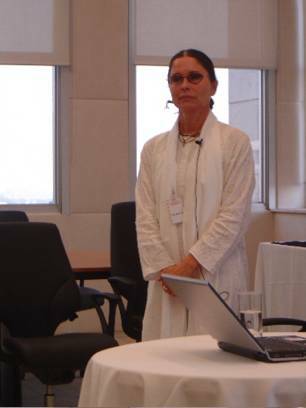 There, she was invited to give a lecture to the board of directors. She explained to them that we are not this body, but we are its inner potency, and that we all must dedicate more energy to spiritual life. Rohini Shakti DD who is being constantly invited to give lectures to businessmen and important people from different fields. Rohini Shakti DD explaining that we are not this body, but its inner potency. 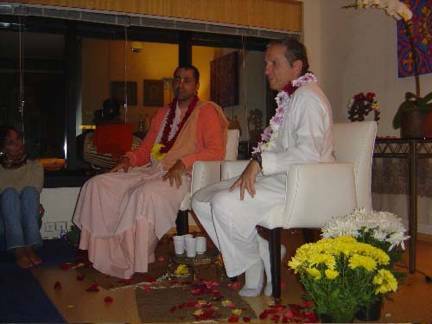 The president of Mapfre is a supporter of the Sri Chaitanya Sridhar Govinda Seva Ashram in Campos do Jordão. 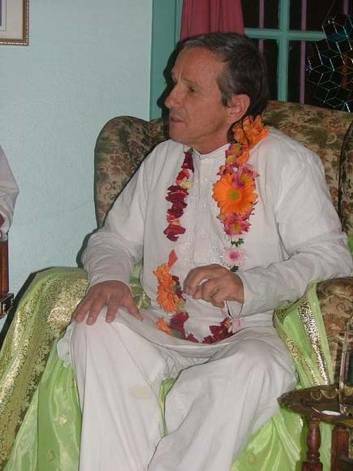 He has hired a yoga team under the supervision of Rohini Shakti DD to take care of his directors and supervisors — and the payment will be an air ticket for them to go to India to visit Srila Gurudev in December! 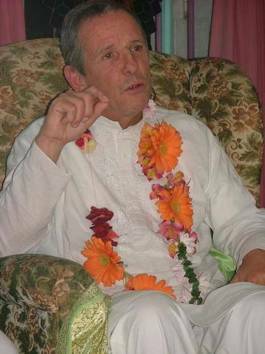 All glory, all glory to Srila Gurudev Srila Bhakti Sundar Govinda Dev-Goswami Maharaj, who is an Ocean of Mercy and who has the most incredible associates!